People's obsession with Bollywood movies is beyond expression, attributing greatly to their soul-touching songs. Estimates show that at least 5 songs are interspersed in every Indian film, which is nothing less than the Hollywood musicals. Hence to free download Hindi movie songs MP3 for listening to them on the road slides into audiophiles' daily life. Here we are going to point out the best free music downloader to cope with your free Hindi movie songs download needs. One of the fast yet 100% free HD Bollywood Indian movie song downloader software you can count on is MacX YouTube Downloader, which is able to download free Hindi movie songs in MP3 format, download the latest Hindi dance songs like Dance Basanti, Tharki Chokoro, all Hindi romantic love songs such as Deewana Kar Raha Hai, Pakeezah, hot Bollywood movie songs in Hindi, and even the classic Bollywood movies like ABCD 2, 3 Idiots, PK in full length with 100% audio and video quality reserved. Whether you are looking forward to downloading Hamari Adhuri Kahani, Banno for free, or get free download of PK full movie, it will live up to your hype. Tests show that it only takes 30 seconds for Hindi song Jeena Jeena download in MP3 format, thanks to its advanced YouTube download engine. You will surely want to join the abovementioned Indian movie songs into download option to enlarge your playlist. So follow the guide below to free download Bollywood movie songs in Hindi. Please note, MacX YouTube Downloader allows to free download Hindi video songs, movies, songs, TV shows, funny videos, trailers, episodes, video clios, etc from 300+ sites, including YouTube, Dailymotion, Vevo, Vimeo, etc. Here we take to free download Hindi movie songs from YouTube as an example. Step 1: Free download the best Hindi movie songs free download software on your computer, install and run it. Step 2: Go to YouTube and type in the search line "Hindi movie songs" or the name of the specific music like Jeena Jeena. Copy and paste the URL of the Hindi film song to download. Click "analyze" to load the music of Bollywood movie. Here you are allowed to choose the resolution, format, codec and file size from the drop down box. Note: This online video downloader is updated to download HD video in 1080p/720p and even 4K (4096p) with high quality reserved. So it is free of yourself to get free download of Hindi songs video with the upmost quality. Step 3: Hit "Download Now" button to start to free download Indian movies in HEVC. 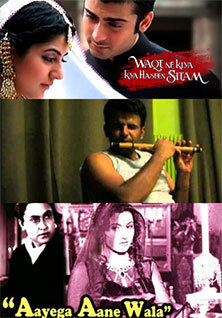 Bollywood movies are never short of best Hindi movie soundtracks. So prior to the step-by-step guide to free download Hindi movie songs, here we've compiled a list of top 3 best Hindi Songs from Indian movies. Top 1 Man Re Tu Kahe Na Dheer Dhare: One of the most memorable Indian song from the Bollywood movie Chitralekha 1964. It is performed by Mohammed Rafi, which is a pensive song about letting go. It topped the list of the all-time favorite Hindi movie songs download list in 2010, according to Outlook India magazine. Top 2 Waqt ne kiya kya haseen sitam: Sung by Geeta Dutt for the film Kaagaz ke phool, which was released in1959. Kaifi Azmi wrote the inspiring lyrics, while music was composed by the maestro S.D. Burman. It is a timeless bittersweet love story set, considered as one of the old yet best Hindi movie songs. Top 3 Aaega aane wala: Lata Mangeshkar's evergreen classic Aayega aayega has echoed for over six decades. It is a humongous hit and a timeless work of art from one of the most memorable Hindi movie Mahal (1949). No wonder many music lovers download the Hindi movie song for lifetime collection. There are a great number of sites offering the download of free Hindi movie songs. Just check out the best ones. YouTube: One of the Hindiest sites, comprising a whopping songs in Hindi but also movies from Bollywood. Indiamp3: It is available for you to download famous Hindi songs/albums/soundtracks from Hindi movies and help to discover the popular Hindi singers as well. The only shortcoming is it contains ads. To avoid ads, you can count on the Hindi video song downloader to free download Hindi movie songs. Bollywoodhungama: It contains not only Hindi songs but also a lot of data involved in Bollywood. Whether you are after Top 10 Hindi songs, Top favorite Bollywood movie music or the top rated Indian songs, this site meets all your needs. Note: Many websites offer the option to download Hindi movie songs on condition of a premium member or becoming a subscribers, let alone the format issue while playing the downloaded Bollywood movie songs on your mobile devices. Fortunately, the professional MacX Video Converter Pro comes to save you life, as it helps to download Bollywood movies and Hindi film songs in MP3, AC3, AAC, WMA, MP4, MOV, AVI, etc and offers the preset profiles for the latest iPhone 6S/Plus, iPad Pro, iPad mini 4, Samsung Galaxy S6 edge+, HTC One M9 and more. FYI, 2016 is not only the year with new Hollywood movies but also choke full of wonderful yet new Bollywood movies with a lot of awesome songs. Here is the list of the top rated yet latest Hindi movie songs in 2016, as well as other hot hindi songs from 2017 Bollywood movies.